The loss of natural teeth doesn’t have to be permanent here in Downers Grove. At Esplanade Dental Care, Dr. Albert and Dr. Snow are proud to offer a truly revolutionary treatment option for patients in need – dental implants. While traditional reconstructive services have only concerned themselves with recreating the crown (the white portion) of a missing tooth, dental implants start with the root that’s well-hidden under the gum tissue. This method creates an enduring foundation for the new tooth that maintains a high level of oral health while also leaving patients with results that feel, look, and function just like the genuine article. Our team is happy to offer every stage of dental implant treatment – including the surgical components – right here in in-office for optimal patient convenience and comfort. To get started with an initial consultation, contact us today. Dental implants will require several steps to complete fully, starting with their initial surgical placement into the jawbone. While many general dentists in the greater Chicago area have to refer their patients to specialists for this process, Dr. Albert has the advanced training needed to keep your care in one location. Once we’ve successfully inserted the implants, their biocompatible structure will gradually bond with the natural bone and gum tissue. The final result is a sturdy foundation that’s fully prepared for your replacement tooth. 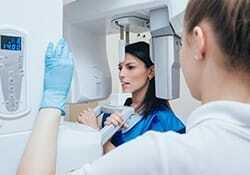 In order to plan your implant placement procedure, our team will use our CB/CT scanner to create a fully 3D X-ray image of your teeth, jawbone, and other surrounding oral structures. This will help ensure that the placement is more accurate and precise, leading to a successful treatment as well as an easy recovery. Not every provider of dental implants uses this device, but we feel that it is necessary in order to achieve the best possible results. There are several options available to restore implants, and your specific solution will depend on personal preferences and the number of teeth/implants that need to be recreated. 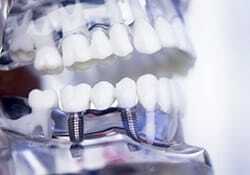 Implant-retained crowns and bridges are popular options. Implant-retained dental crowns are crafted from high-quality porcelain materials that are essentially identical to natural teeth. 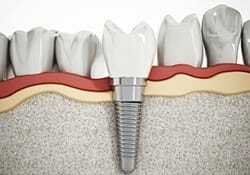 They can be used to rebuild a single tooth/implant in a way that does not negatively affect adjacent healthy teeth. Our team will use a temporary crown at first until the gum tissue has successfully healed and grown around the restoration in a natural manner. Then, it will be swapped with the permanent one. Implant-retained bridges are similar to traditional bridges, and they will be used to restore consecutive missing teeth along the same arch. Instead of filing down natural teeth to accommodate dental crowns, implants will be placed instead on either side of the gap in order to anchor the prosthetic securely in place. This option is ideal, as the patient’s continuing oral health will be better preserved and natural teeth will be spared from negative alterations. If a patient has lost some or even all of their natural teeth, implant-retained dentures can often be successfully used to revitalize oral health and restore an ideal amount of biting function. Because our doctors will only place a small, strategic number of implants within the jawbone to provide support, this option is also typically more cost-effective. 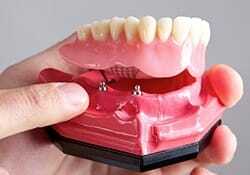 There are two major types of implant-retained dentures – hybrid dentures and overdentures. Hybrid dentures are permanently fixed in place within the mouth by our team, and they will feel and function like natural teeth. Overdentures are designed to have the same removable quality as traditional dentures, which means patients can reap the health and longevity benefits of implants while also maintaining the convenience they’re used to.